Volume II contains Anne Dutton’s once well-known and widely circulated A Discourse upon Walking with God (1735). Once read and referred to by George Whitefield, it contains spiritual insights for practical daily living. 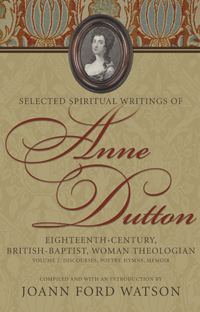 Dutton’s hymns and poetry are also included in this volume. Dutton’s poetry, A Narration of the Wonders of Grace (1734), was a prominent publication in her day. It contained 1,504 lines of poetry in six parts based on themes of sal-vation. Her biographer, J.C. Whitebrook, referred to it as her “chief literary production.” Sixty-one of Dutton’s hymns composed on several subjects are also included in that volume. Her biographer, J.A. Jones, noted that these were written for “plain and homely folk” in the “midland countries.” Dutton’s con-tribution to evangelical spirituality, poetry, and hymnody in the Baptist tradition is significant.